River Valley Construction paving services not only offers small residential jobs, but also very large complex jobs for commercial and municipal projects. 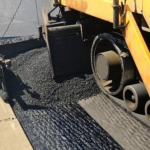 We are your one-stop source for any and all residential, commercial and industrial asphalt paving services throughout Connecticut. We have been the leading choice for many general contractors, building owners, and property managers for construction of new parking lots and reconstruction of existing lots. We have our own excavation equipment, so you will not need to hire outside excavation services. We provide high-quality paving construction including excavation, stone base, and multiple paving options. We install, repair, and maintain both driveways and parking lots in order to keep your surfaces smooth and safe for your family, employees and customers. Although all projects are different, our reliable and professional team strives to complete jobs on a timely basis while also providing you with quality work. Whatever your paving needs, turn to River Valley Construction for reliable service that covers all aspects of the project.